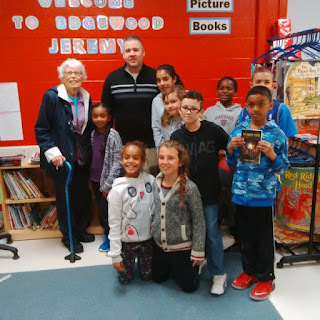 Jeremy Hayes returned to his old public school in Scarborough, Edgewood, to speak with two groups of kids about writing books and got them started on their own project to make their own short comic book. It was held in the school's library where Jeremy read his first books as a kid and sat on the same floor listening to others speak about writing. It was a wonderful experience to return and meet with a fantastic group of young students. Mrs. Sneddon, who was Edgewood's former librarian and Jeremy's Grade 4 teacher, also showed up for a visit. Mrs. Sneddon played a big role in inspiring kids to read and write.